Astronomer and broadcaster Sir Patrick Moore – who has died aged 89 – interviews astronaut Neil Armstrong on his BBC programme The Sky at Night in 1970. 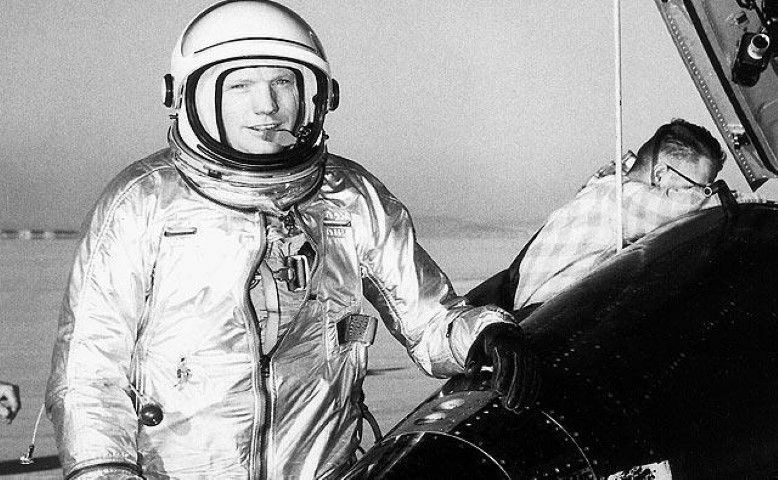 Neil Armstrong, the American astronaut who was the first man to walk on the moon, has died at 82. In a 1970 interview with BBC Television, months after he returned from the Apollo 11 mission, Armstrong recounted his experience on the moon, describing its surface and the experience in vivid detail. Oh, I am quite certain that we will have such bases in our lifetime, somewhat like the Antarctic stations and similar scientific outposts – continually manned. Although, certainly there is the problem of the environment, the vacuum, the high and low temperatures of day and night. Still, in all, in many ways, it’s more hospitable than Antarctica might be. There are no storms, no snow, no high winds, no unpredictable weather phenomena that we’re yet aware of, and the gravity is a very pleasant kind of place to work in – better than here on earth. I think it would be quite a pleasant place to do scientific work, and quite practical. Armstrong’s optimism exemplified the golden era of space exploration in the United States and he will forever be remembered for his contribution to American ideals.